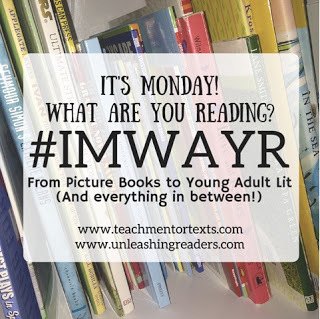 My reading life this week is dedicated to all you #IMWAYR participants. Because of you, I've got some brilliant older titles on my list today. I'm also thankful for all the 'hot off the press', and 'you have to wait awhile for this one' reviews. I'm thankful to all of you for introducing me to so many books that I would otherwise have overlooked. You make my reading life immeasurably rich and satisfying. 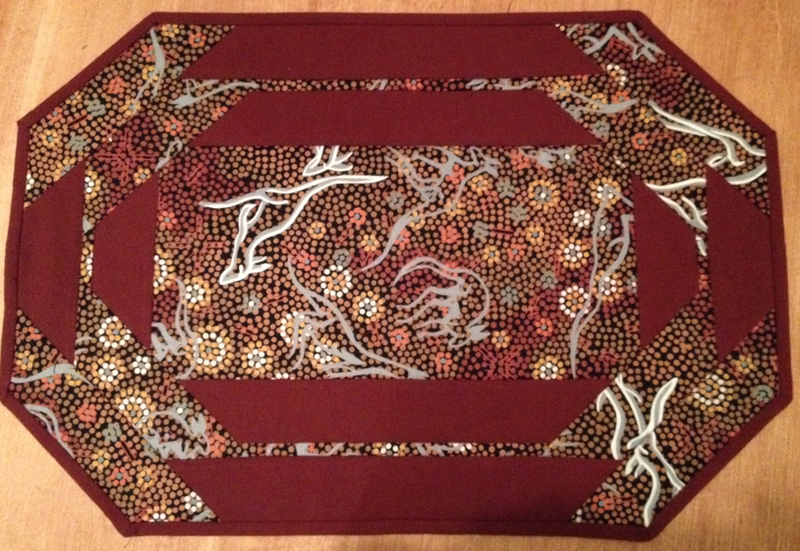 I got in a bit of reading with my eyes this week, but spent a lot of time listening since I was busy sewing a set of placemats to give away as a wedding present this weekend. 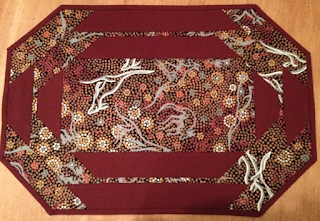 I dug deep into my stash and found some leftovers from another placemat project and created four of these. I hope they like them! I also spent time babysitting with my grandson and read one of my favourite books to him. This is a glorious celebration of the power of storytelling. The illustrations made me itch to capture some of these designs in fabric. There is so much to gush about: the beauty of the blues, the power of the golden brown and the details in the illustrations. All these things transport us into another world where anything is possible, even human beings' capacity to outwit the djinn of a desert storm. 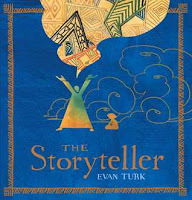 This book reminds us that stories in our libraries, especially the ones that show us ourselves, are more important than any kind of monetary treasure. These gorgeous illustrations and Margaret Wild's prose tell us the story of a special kind of treasure worth more than jewels and gold. When a young boy and his father are forced to flee their homeland because of war, they take with them a book that tells them their history. As they flee they are forced to abandon their belongings. Eventually the boy is forced to bury the treasure. Much later he returns to find it. I'm sure I have Linda B to thank for introducing me to this book by two French Canadian artists. It's set at the time of the ice storm in Montreal. 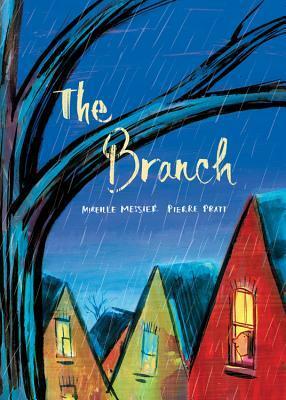 When a young girl's beloved branch falls off the tree, her older neighbour helps her to create something new from it. I really wish that this book had been available for me to read before I visited this remarkable place. 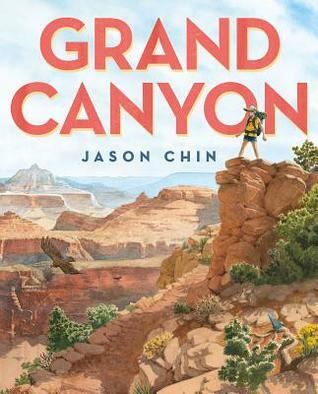 The book takes us on a journey through the geological regions that reveal the history of the canyon. At the same time, it introduces readers to the different ecological habitats that exist in these different regions. Notes in the back matter provide additional information for readers who want to know more. The bibliography provides sources for readers who thirst for even more, as well as showing us just how much research goes into a book like this. This is the true story of Nokomis (Grandmother) Josephine Mandamin who began Mother Earth Water Walkers, a movement of women (and men), who walk to raise awareness of how precious water is to us. 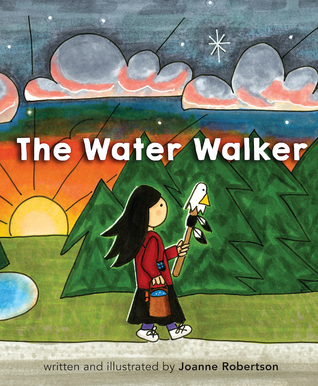 The story is told using Ojibwe vocabulary and is filled with colourful bold illustrations. I will have a full review posted nearer to the publication date. It seems that people either love or hate this book. I am one of those who adore it. I love the slow thoughtful pace. I loved that as a reader I was constantly wondering, thinking, and doing my best to make connections in this coming of age allegory. It is exquisitely written. I'm not sure students will fathom the richness of this novel, but I would love to be part of a book club book discussing it. Just Wow! This book is the reason I will join Carrie Gelson and the #MustRead gang again next year. I probably wouldn't have gotten around to reading it if I hadn't put the effort in to identify some books on my Out Of Control to read list on Goodreads. 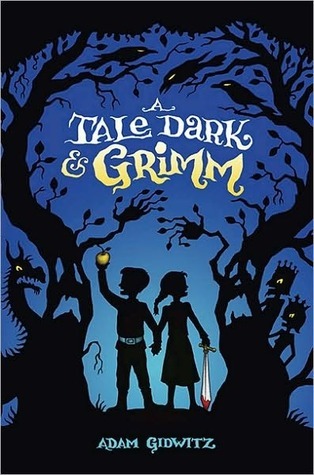 Honestly, there is so much to love about this twisted fairytale starring Hansel and Gretel. I was worried because that is the one fairytale that creeped me out as a child. It is still creepy, but also loaded with humour. If you haven't read it already, go get a copy and read it for yourself! This is another of my #MustReadIn2017 titles. 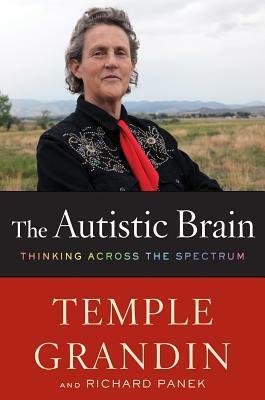 It is filled with all kinds of important information about cognitive science and how we have looked at autism across time. There is a pragmatic component that makes me think that it should probably be required reading for all people who work with other people. I'm still reading The Inconvenient Indian by Thomas King. I'm having a hard time with Elsie Mae Has Something to Say by Nancy J. Cavanaugh, (a Netgalley title,) and might just give up on it. Just how many pages do you give a book that just isn't working for you? Is 100 enough? I'm listening to Do Not Say We Have Nothing by Madeleine Thien. I started it ages ago, but lost track of the story and had to start all over again. I'm still focusing on books from my reading goals, so I'll start Relish, My Life in the Kitchen by Lucy Knisley next. This pile of books is my read with my eyes goal for next week. Unfortunately, I am easily sidetracked by a shiny new hardcover. The Storyteller is a gorgeous book. The illustrations in Grand Canyon are amazing. His book Redwoods is still my favorite. I enjoyed Orphan Island, but I wish the ending provided me with more answers than questions. Part of what makes Orphan Island so fascinating is how people respond to it in many different ways. When I see it as an allegory, I understand that we all leave childhood behind without knowing where we will end up. Your placemat is beautiful. I'm sure they will love them. 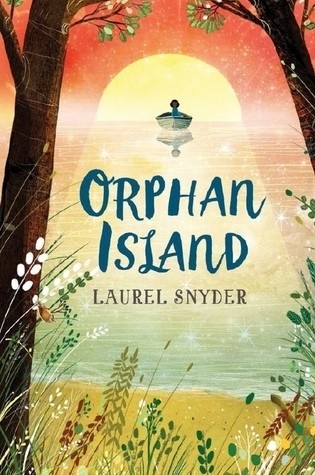 I'm looking forward to reading Orphan Island. The Branch sounds very interesting. Thanks Stacy, I'm looking forward to reading your thoughts on Orphan Island! 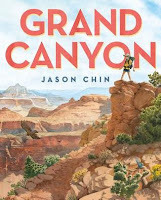 I love all of the books of Jason Chin! I hope you will read them all. like Lisa, I adore his Redwood book. I loved his Water Cycle book too. The only one I have yet to read is Coral Reefs. Thanks for sharing the adorable picture of your grandson! He is so cute! I also thought The Treasure Box was a beautiful story! 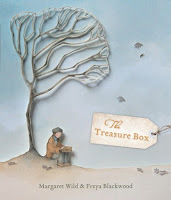 It would be a great book to share with young readers at the beginning of the school year, since it illustrates how special and meaningful reading is. Have a great week! Thanks Jana. He is a very special little person. I agree with you about The Treasure Box. Oh that picture with your grandchild made me smile! I will have to grab The Treasure Box. It sounds wonderful. I too really enjoyed Orphan Island. I hope to convince our book club to tackle it this year. He is already fascinated by books! I hope you get to tackle Orphan Island with a book club. It begs to be discussed! Ahhh! So many books I want to comment on! 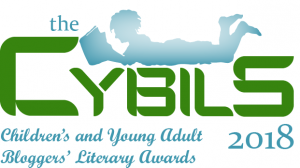 Orphan Island's been on my list for awhile, and your review made me want to read it more! I recently read Gidwitz's book, too, and I loved it! Gidwitz is brilliant! I am looking forward to reading a whole lot more of him! I adored Orphan Island myself! My 12 yo daughter did not like it. I'm still trying to put my finger on what I loved about it. I guess it just spoke to my heart! I wonder if it has to do with being able to reflect back on our own coming of age experience from a distance? Although as I get older and older, I think we are always going through coming of age experiences. I connected to a lot of them in the book.